Many of us experience our thighs rubbing together… through the body heat, and perspiration getting trapped, the thigh skin will become irritated; you can experience itchiness, burning feelings, red areas, and in some cases it can even result in blisters. If you experience these symptoms on your skin, try to keep the skin cool and use a solution to prevent the thighs from rubbing together. Luckily, we have developed a solution for that! Be Sweet To Your Legs – Say Bye to that rubbing thigh! you feel comfortable all day long. So, it’s finally time to… say bye to that rubbing thigh! Firstly, a new product we have launched is the ‘Be Sweet to Your Legs’. This product is worn around your thighs and will prevent skin to skin friction. The ‘Be Sweet To Your Legs’ will stay in place without rolling up or down, due to the applied silicone trim at the top and bottom of the band. The soft and smooth fabric will make sure you feel comfortable all day long. Another solution to rubbing thighs, is wearing shapewear with legs. By wearing shapewear with legs, your skin will not directly rub against each other. This will prevent skin to skin friction, and irritated skin. We have a couple amazing products in our collection that will help you with any thigh rubbing issues. See more on the other side! Body Hugging Bamboo is the exciting new collection from MAGIC Bodyfashion made from natural, green and eco-friendly raw bamboo fibres. The unique properties of bamboo fabric (softness, better ventilation than cotton, moisture absorbent and anti-allergenic) combined with the durability provides a perfect alternative to traditional textiles and MAGIC have made extra sure that they only use sustainable bamboo species, regularly visiting their suppliers to ensure good working conditions and reforestation. The new collection launches in February 2019 and will consist of a Comfort Bra and matching brief as well as a Comfort Bra with spaghetti straps for those who prefer a thin strap. The products will be available in Bamboo Mocha and Bamboo Rose with more silhouettes planned for later in the year. Bamboo fibres are reformed cellulose fibres that are made from bamboo pulp. The pulp is a natural, green and eco-friendly raw material, that can be degraded in soil and mixed with other materials (e.g. cotton, hemp, silk). To make it strong, Bamboo textile is nearly always combined with other kinds of textile. That is because bamboo fibres are shorter than cotton fibres. By combining them MAGIC Bodyfashion BV can make sure you get a strong product. The fibres can only be made during the viscose production process. The bamboo stems are made smaller and are chemically treated. This composition is then pressed through nozzles, which results in a thin fibre. These thin fibres are then made into yarn. And from that yarn, the fabric is made. MAGIC Bodyfashion BV value honest products and do not use any endangered bamboo species. Their bamboo they use is not the same as the food for pandas; it comes from bamboo plantations in China and can easily be reforested. To ensure good working conditions they regularly visit their producers. 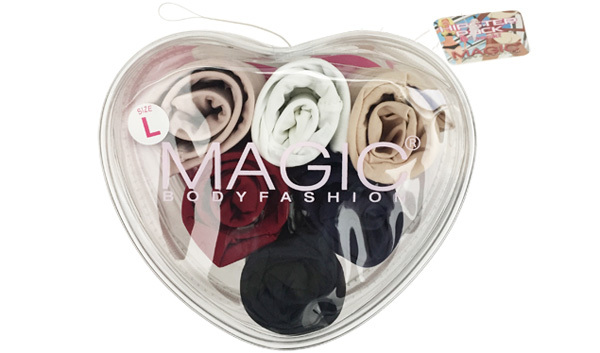 Introducing the exciting new collection from MAGIC Bodyfashion – MAGIC Mommy! From November 2018 the first four exciting products from the MAGIC Mommy collection will be available in a bid to make pregnancy and post birth a much more comfortable experience for mums! The Mommy Comfort Nursing Bra is comfortable and made from soft, smooth fabric to avoid any irritation on the breast area. It has a regular bra closure at the back but one-handed nursing clips at the front to allow easy access for breast-feeding while holding your baby. Inlay pads in the cups allow for a nice bust shape but are completely removable for preference and it is available in black, latte, white or rose and an easy size option of S-XXL. Next up is the Mommy Supporting Belly Band which is made from the same soft and smooth fabric for all-day comfort. The band supports the baby-bump with a special under bump panel and also provides extra support for the lower back where many expecting moms experience aching. Available in S-XXL. For legs support the new collection is offering either the Mommy Supporting Tight or the Mommy Supporting Legging. Both are a high waist design which goes over your baby bump and gives comfortable support for the belly. The tights and leggings are 80 denier with a matte look and can be worn not only in your pregnancy but afterwards as well. The options are n sizes S-XXL. Extra products are being introduced to the range next year, so it will be a great collection to keep an eye on – providing all over body support for mums both before and after birth.